Mars Reconnaissance Orbiter has just snapped another photo of Opportunity sitting on the ground on Mars. These pictures never get old. This one shows Opportunity at the rim of Santa Maria crater; it was taken on December 31, 2010 (sol 2466). The HiRISE camera on Mars Reconnaissance Orbiter acquired this view of Opportunity sitting at the edge of the 100-meter-diameter crater Santa Maria on December 31, 2010, or sol 2466 of the rover's mission. If you enlarge the image and zoom in you can actually see the shape of the rover's shadow including the mast on which the cameras are mounted, which is just incredible, considering that those things are skinnier than the size of a HiRISE pixel. Whenever I see a HiRISE photo of Opportunity, I always want to know what the view from the ground looked like at the same time. 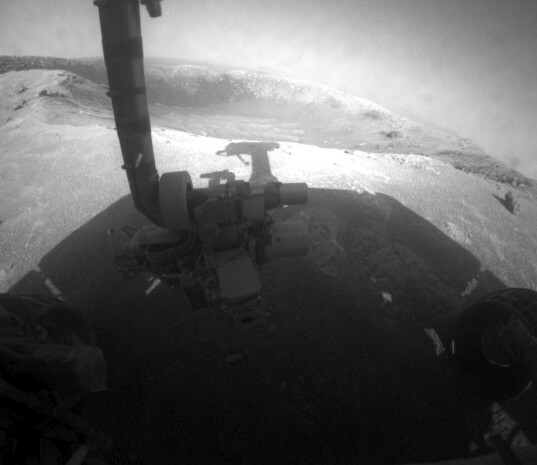 So here you go: this was taken two days earlier, but shows Opportunity and her shadow in the same positions they occupied when the HiRISE photo was taken two days later. Just think about that -- we have incredibly detailed views from the sky and from the ground at the same time. In fact, I haven't done the math, but I'll bet you that the HiRISE photo gets better resolution on the east side of the crater than Opportunity's images do. 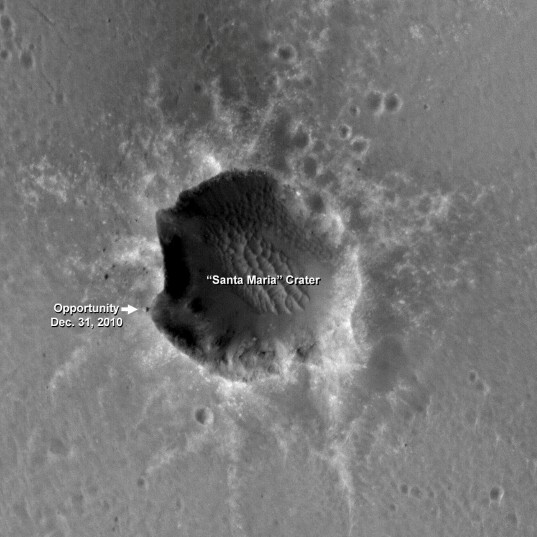 Mars Reconnaissance Orbiter is really living up to its name; its photos and spectral maps (using its CRISM instrument) have identified a spot on the southeast edge of the crater as being particularly interesting mineralogically, giving the Mars Exploration Rover mission key information that will help them make the most of their time on Mars. Rather than stay in this position Opportunity has rolled on to check out those rocks -- which may contain hydrated sulfate minerals, and more records of past water on Mars -- over the coming solar conjunction.